Saturation is a DIY art and music festival that occurs annually in Riverside, CA. Events are held at venues around downtown Riverside, with a majority of the participants based in the Inland Empire. This year Saturation Fest will be held May 26 - 28, 2017. Saturation includes concerts, films, workshops, exhibitions, handcrafted art and more. Join the party May 24th - 26th, 2019 ! Saturation Fest is now accepting applications for the 2019 lineup. We're looking for artists, bands, musicians, performers, art vendors, event curators and volunteers to help make this years festival a success. 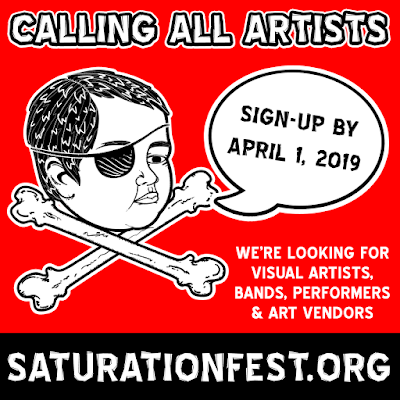 Saturation Fest is a participant-created DIY art and music festival that occurs annually in Riverside, CA. Events are held at venues around downtown Riverside, with a majority of the participants based in the Inland Empire. Saturation includes concerts, films, workshops, exhibitions, handcrafted art and much more. As a mostly all-ages and largely cost-free festival, Saturation pushes for the de-commodification of culture, concentrating instead on the value of the experience. The official Saturation Fest 2019 events will be listed on Facebook, check out all of our events here! 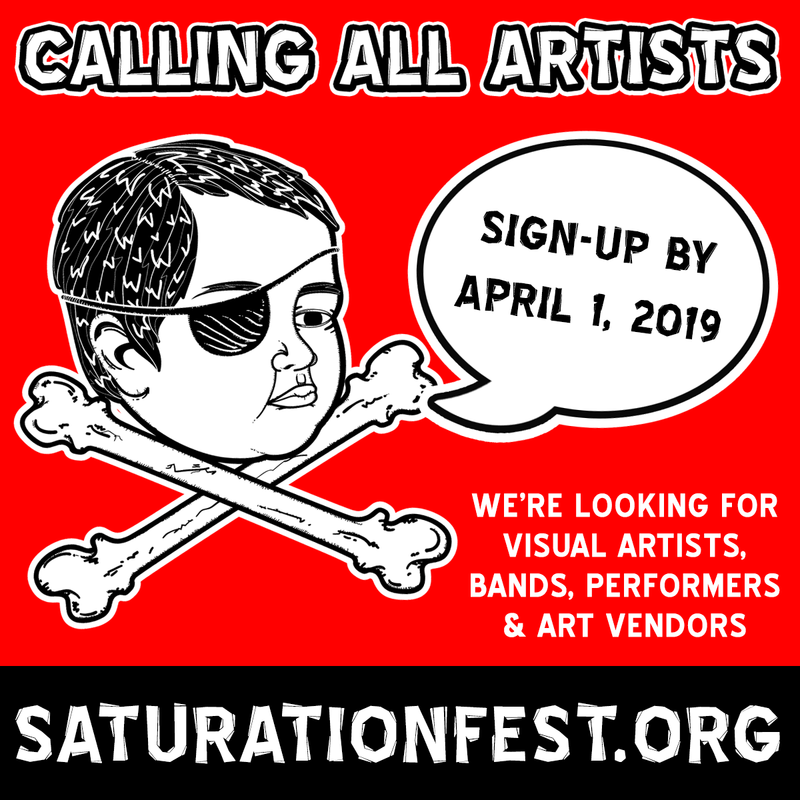 As we approach the festival date, we'll be actively sharing flyers and event updates on social media, so make sure to follow us on FB and IG @saturationfest. A curated playlist of past Saturation Fest performances, interviews and news reports found on YouTube. 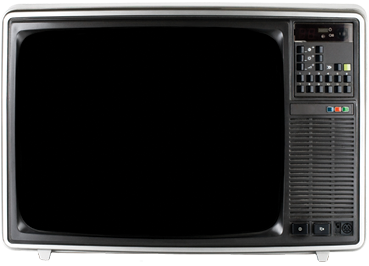 Click the play button on the T.V. screen, turn up the volume and enjoy. 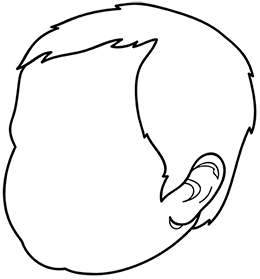 The official site for Saturation Fest's mascot, The Baby Head is here. Check out this awesome collection of hand-drawn Baby Head fan art. Creating your own Saturation Fest Baby Head is now easier than ever! Click here to choose your template, then save or print it. That's it! Baby Talk is the Saturation Fest voice-mail line. What bands or artists are you looking forward to seeing? How's your day? The baby also likes poetry, strange tales about Riverside and journal entries. The baby wants to hear from you. Don't forget to let us know what band your from and where we can find your music. Find out what these blogs and news sources have to say about Saturation Arts and Music Festival. For an archive of photos, make sure to check out our Flickr page.